Prime Minister Narendra Modi, who reached Sikkim today, inaugurated the Sikkim Organic Festival 2016 in Gangtok and addressed the plenary session of the National Conference on Sustainable Agriculture and Farmers Welfare. 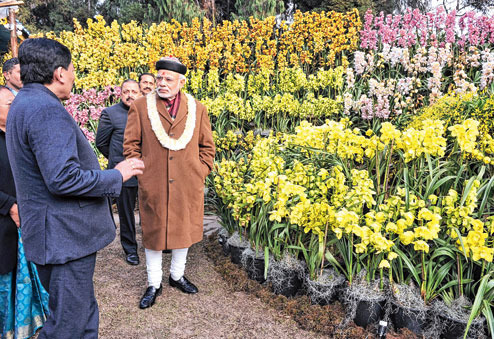 Modi digitally launched the logo of ‘Sikkim Organic’ as well as three new orchid species developed in the state. Handing over two commendations to chief minister Pawan Chamling for Sikkim’s journey towards total organic farming, Modi praised the latter for his vision of welfare for farmers and tribes. He credited this vision for the development the state is witnessing and promised to look into the welfare and development issues raised by the chief minister. Stating that he is in Sikkim as the guest of the farmers of the state, the Prime Minister said the deliberations during the conference had set the tone for a new holistic vision for the country's agriculture. All states of the country could pick up the relevant parts from the presentations, which should be remembered as the “Sikkim Declaration”, he said. Describing Sikkim as an example of resolve towards organic agriculture despite several difficulties, Modi said the whole world has come to recognise the effort of the state’s farmers and that the winds of this sterling effort would now spread across the country. He recalled the recent CoP-21 meeting in Paris, where the idea of “back to basics” had been raised forcefully. “Sikkim has already achieved this feat of living in harmony with nature, and is therefore a model of development,” said the Prime Minister even as he complimented the state for making Gangtok achieve the 10th cleanest city rating in a recent survey conducted by the Centre.